Less protein doesn't have to mean less flavor. Protein is an essential element to any healthy diet, but what most people don't realize is that it doesn't have to be the center of every meal. According to the National Institutes of Health, most Americans easily meet, if not exceed, their daily protein requirements. Only 12 to 18 percent of your daily calories need to come from protein. If you find you need to cut back on your intake, try some healthy, filling low-protein dinners. Always keep boxes of pasta in your pantry for quick low-protein meals. Most kids love pasta, so if you are feeding a family, you will find few complaints. 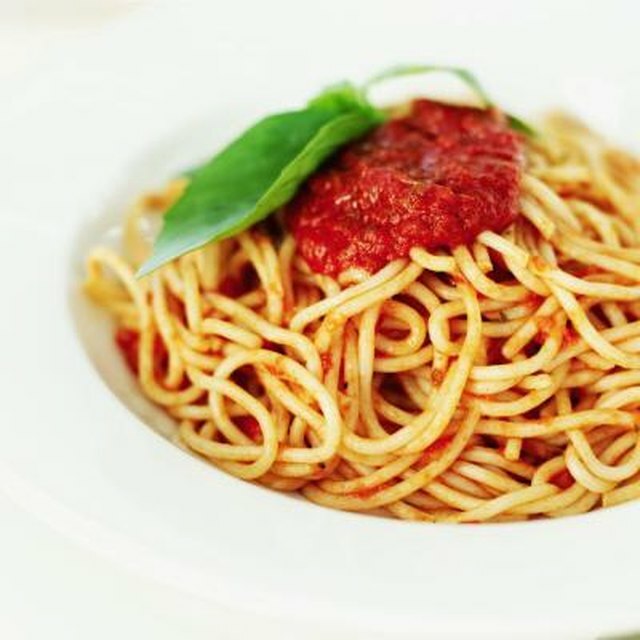 There are so many types of pasta meals to choose from that your family can eat it two or three times a week and go months without having the same kind twice. Tomato sauce is classic, but don't get stuck serving it plain. Mix roasted or sauteed vegetables into your sauce for flavor. Baked zucchini or eggplant with some mozzarella cheese goes well with penne or rigatoni pasta. For a little protein, toss your pasta with a few pieces of shrimp or scallops, olive oil and herbs. Put bowls of steaming pasta on the table next to a generous green salad with light ranch dressing. If you thought the only difference between brown rice and white rice was color, think again. White rice has been stripped of all its nutrients, but brown rice still contains the essential nutrients like fiber and minerals. Being a complex carbohydrate, brown rice will help keep your blood sugar more stable than white rice or white flour products. Top brown rice with your favorite vegetable stir-fry. Thaw a bag or two of mixed vegetables and throw it into a ripping hot saute pan with just a tablespoon or two of olive oil, and sprinkle your favorite vegetable seasoning blends over it. Then scoop the mixture over a steaming bowl of brown rice and serve. On a cold winter night, warm your belly with a creamy broccoli soup. Unlike broccoli soups in restaurants, your homemade version needn't rely on butter and cream for flavor. All you need is the broccoli itself. Cut and boil the stems in just enough water or vegetable broth to cover them. When they are tender, puree them in the blender. This will make your soup very creamy and smooth, and made almost with pure broccoli. Return the puree to the pot and thin it with more water or broth if desired, and add the reserved florets. Season the soup with garlic powder or a little bit of cheese, and serve it with crusty rolls on the side. Dinner needn't be any further than the produce section of your local supermarket. Buy seasonal vegetables that grill beautifully, such as squash, eggplant, asparagus, onion and mushrooms. Slice the veggies if necessary, then all you need is a brushing of olive oil and sprinkling of salt and pepper. Grill the veggies for about two minutes on each side over high heat. If you don't have a grill, broil the vegetables. Stack the veggies with a smear of ranch dip on crusty French bread, and serve the sandwiches with some homemade or store-bought potato chips. National Institutes of Health: How Much Protein Do You Need? How Long Does It Take to Cook Linguine?